A Shepherd's Heart: Let your light shine before all mankind! On a recent family vacation, we were blessed with the use of a friends house situated by a beautiful lake. Out of the reach of the light pollution from the city lights, typically on a clear night the sky comes alive with the milky way and other constellations visible in a brilliant display of God's creation. On this trip it just so happened to coincide with a Super Full Moon and because of the additional brightness of the moon, the stars weren't visible as they normally would be out there. It was still a beautiful sight to behold and over the course of the days we vacationed there, the moon shone brightly each night and the reflection off of the water was incredible! As I gazed at the brilliance of God's handiwork I was reminded of the simple fact that when we look at the moon and see how brightly it reflects the sun, you realize again that the moon wouldn't shine at all without the sun. Likewise as a follower of Christ, we should strive to reflect The Son brightly in all we do! He is the reason why you and I shine at all! So my friend...shine brightly for Him because of Him as He is our light and hope and in turn, we can shine His light and hope to an often dark world. 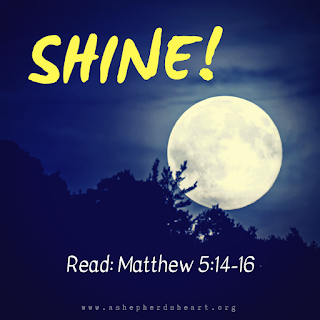 Read Matthew 5:14‭-‬16 ESV and then shine out His light before all mankind!